To immediately access over 30 online courses and books tailor-made for the modern Edupreneur - for just $47, simply join The Edupreneur's Academy. Your first 30 days are FREE! Click below to get the 30 day free trial. Members of the Edupreneur Academy get over 30 online courses, OVER 7 books and frequent challenges in all of the topics above to access anytime, in full, whenever they wish. They include highly practical, follow along demo videos, explainers, templates, downloads, discussion areas and more. You ALSO get access to ALL future added online courses as part of your membership too at no extra cost. 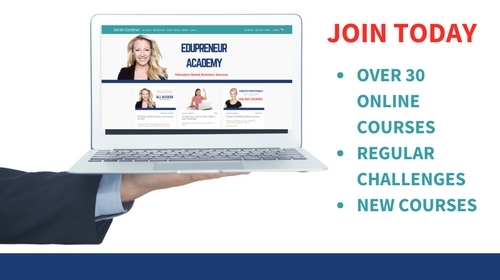 There is ALREADY over $10,000 worth of online training openly available to all members of the Edupreneur Academy right now, and that grows all of the time at no extra expense to existing members. You get INSTANT ACCESS TO EVERY COURSE, IN FULL, IMMEDIATELY. There's no need to scour the internet for the information you need, or to pull your hair out trying to work out the best options, tools and strategies for our type of work. We are unique, and the resources that you need to be successful are too. Members of the Edupreneur Academy get tailor-made access-anytime resources, training, how-to strategies, challenges and guidance especially for your unique line of work. Get everything you need, all in one place, designed especially for your edupreneurial endeavours, right away in the Edupreneur Academy. ALL of the online courses and books listed below are INCLUDED IN FULL in the Edupreneur Academy members area. You can access all of them at any time, take them in any order you like and are not restricted by any drip-release of content. It's all yours, right from day one of your membership. Each of the buttons below show you more detail about each course, as well as the normal price you would pay if you bought each course individually. However, all Edupreneur Academy members get access to all of the courses and books below for just $47 a month - cancel ANYTIME subscription. MEMBERS BENEFIT FROM CONTINUOUS NEW CONTENT BEING ADDED TO THEIR DASHBOARD. All existing members of The Edupreneur Academy also get all future content upgrades at no extra charge. How will I be charged for access to all of these courses? When you sign up for the 30 day free trial, you will get immediate access to all training. Unless you cancel your subscription, you will then be automatically charged $47 (USD) per month after the 30 day trial period has passed. Your nominated payment method will be automatically deducted from once a month after the 30 day free trial period to continue your access to the training. You can cancel your subscription at any time, but as soon as you cancel, you immediately cease access to all of your training. Yes. You can cancel your membership yourself at ANY time from inside your own dashboard with no questions asked. The first time you click to purchase your Edupreneur Academy membership, or start the 30 day free trial you will need to sign up and create your own login details. As soon as you have started your free trial, or paid your first $47 you will have full access. You will need to log in with your own log in details each time you access your training. It is recommended that you save the Edupreneur Academy to your favourites so that it is easy to find next time. You will also be sent a welcome email with the link to your member's area for reference. Do I get access to all of the training immediately, or is it drip-released? You get immediate upfront access to all content in full. There is no drip-releasing of content around here! Get stuck in! Can I just watch all of the courses in one go during the free trial and then cancel my subscription right away? Yes. We reward hungry learners. Feel free to join the free trial (which gives you access to everything), then gobble it all up in one mammoth sitting, and then cancel your subscription. You'll need a pretty big sitting though!! Do I have to become a member to access your training? No. You can purchase the online courses individually for a one-off fee. Simply click on the course images above to purchase them one by one. Note, if you purchase courses individually, you get lifetime access to the course. If you get the subscription, you only have access for as long as you are a member. Will my monthly membership fee increase? Not if you stay a member, no. Although the membership price does increase every year to reflect the huge additions of courses to the member's area, all existing members maintain their access at the same price FOR LIFE (as long as you don't cancel), and the price increases will only apply to new subscribers. If you cancel, you are then considered a 'new' member again and if the price has increased, your monthly membership fee would reflect the most up to date pricing. If you do not cancel, your monthly membership fee will be honoured for as long as you maintain the payments and include all future upgrades at no extra costs. Will I get new courses and content? Yes. All members will have new courses and content automatically added to their member dashboard at no extra cost to their monthly subscription. Feel free to email Sarah directly via the CONTACT FORM with your questions, or ask them in the Facebook group 'Entrepreneur to Edupreneur'. Is Over-Regulation of The VET Sector Killing Our Children’s Futures? Are Online Courses As Passively Profitable As Everyone Says They Are? What If You’re Too Young or Too Old To Create an Online Course? What’s The Point of Your Online Course?